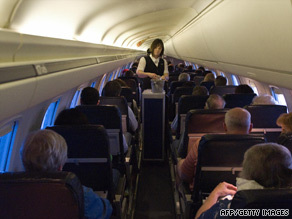 (CNN) -- It takes a lot of skill, patience and diplomacy to work in a confined space at 35,000 feet. Flight attendants deal with hundreds of people every day. The job requires lots of patience and diplomacy. Flight attendants have to deal with all sorts of different people and situations, and they do it with grace as they zip around the country and the globe. Most trips go smoothly, but alcohol and bad behavior can cause things to go downhill fast. Three flight attendants offered insights into how they deal with some common problems on board and offered advice about getting their attention. Some passengers feel funny about pressing it, while others have no qualms about doing it repeatedly. Flight attendants say the button is there for a reason, and if you need them, you should press it, especially if you require medical attention. "I answered a call a few weeks ago, and the lady was passed out," said Kim Kaswinkel, a flight attendant for 22 years who holds a legislative committee chair position at the Association of Flight Attendants. "You never know what you're going to get when you answer this call bell. Anything from a little kid ringing to ask if they could go to the bathroom to [a passenger saying] 'My wife is unresponsive,' " Kaswinkel added. Flight attendants say they understand if you call them because you need something extra to drink or a blanket, especially if you're sitting in the window seat and you're blocked by your neighbor sleeping in the aisle seat. Does your heart sink when there's an empty seat next to you on a plane and a person approaches with a child? Flight attendants say there is little they can do about crying infants other than to ask the parents if they need anything to help quiet them. Babies often scream in flight because their ears hurt due to the pressurization, said Rene Foss, a flight attendant for 25 years and the spokeswoman for the Association of Flight Attendants. When it comes to problems with older children, flight attendants say they look to parents to control them, but sometimes step in. Flight attendants are on the lookout for passengers who have had too much to drink and will stop serving alcohol to those who appear intoxicated. The process can be delicate in a confined space. "It's a fine line because sometimes when you tell somebody they can't have another drink, you just end up making them angry and they get even louder," Foss said. Kaswinkel admired how a fellow flight attendant was able to defuse such a situation with humor. "She asked the gentleman who had a lot to drink, 'Do you think I'm pretty?' He said, 'Oh honey, you're beautiful,' and she said, 'You're drunk, you're cut off,' " Kaswinkel recalled. Heather Poole, a flight attendant for 14 years who writes for the travel Web site Gadling.com, said she prefers to work on morning flights because there's virtually no alcohol consumed, while evening trips are often full of passengers who are trying to unwind after a day of work and order lots of drinks. If a flight attendant encounters passengers who are rude or difficult, a common way of trying to resolve the situation is simply to ask another crew member to talk with them. "A new face is new energy, and even though they may tell that person the same thing I told them, they don't already have that feeling like I don't like them or I'm trying to be controlling," Poole said.